We’re at the corner of Tremont Street and Appleton Street. The entrance to our building is on Tremont Street (to the left of Masa). The main door to the building is unlocked during business hours, but the inside door will remain locked throughout the day. Once inside the first door, go to the panel on the left and dial 004. Someone on staff will buzz you into the building. Take the elevator to the fourth floor. If you have questions, call (617) 423-6300 and someone will be happy to help you. Street parking is available on Tremont. Meters cost $1.25 per hour, and parking is limited to two hours. 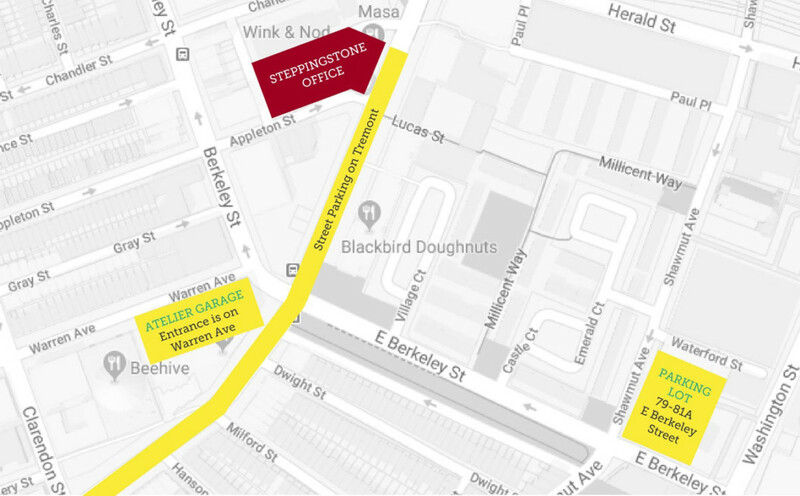 Atelier Garage (505 Tremont Street) is a short walk from the office. There is also a parking lot at the corner of Shawmut Ave and Berkeley Street. Click here to see a map of parking lots and garages in the area. GREEN LINE – Arlington is the closest stop (about a 9 minute walk). 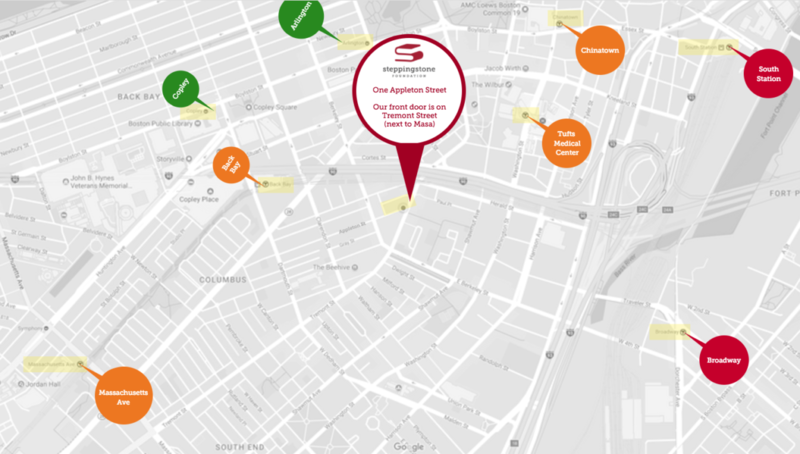 ORANGE LINE – Back Bay and Tufts Medical Center are both nearby (about a 10 minute walk). RED LINE – Broadway and Park Street are the closest stations (about an 18 minute walk). You can also transfer to the Green Line (at Park Street) or the Orange Line (at Downtown Crossing). BLUE LINE – State Street is the closest stop (about a 25 minute walk). You can also transfer to the Orange Line at State Street and take it to Back Bay or Tufts Medical Center, which are much closer to the office. 43 BUS – This bus stops at Tremont Street and Appleton Street, directly in front of the office. Click here for a map of all bus service in the area.